Kidding aside, though, I liked this episode of Poldark 2015 better than the previous one, though I still found it a mixed bag. Consequently, I’m breaking my commentary into three subcategories: The Good, The Bad, and The WTF? *They’re doing right, essentially, by the Ross and Demelza slow-burn romance: the way Demelza anticipates his needs/wants before he can utter them was sweet and funny (in a production that sometimes seems to lack humor); the softening of Ross’s expression as he watches Demelza dancing at Jim and Jinny’s wedding; the sensuality of the seduction scene with That Green Dress; Demelza’s blissed-out expression the morning after and the way her face falls when she returns to the house and sees Elizabeth there; and the way the two women size each other up and neither likes what she sees. Eleanor Tomlinson is gradually winning me over as Demelza—no mean feat as I love Angharad Rees’s utter fearlessness in the role. Tomlinson’s is a softer, more timid incarnation of the character, but there is room to grow in confidence and poise as Demelza matures. *Wheal Leisure: the opening montage of the miners emerging from the morning mist to march towards their new place of employment was genuinely stirring (even if I did want to burst into a rousing chorus of “Hi-ho, hi-ho, it’s off to work we go”—after all, the seven dwarves were miners too). And I tend to prefer Ross in work mode, since it reduces the amount of time he spends brooding over Elizabeth. *The Reverend Dr. Halse: Whether it’s the passage of 40 years or just superb make-up and costuming, Robin Ellis (the original Ross) managed to submerge himself completely in the character of this prissy, stuffy, hidebound magistrate. Even his voice was different, fluty and slightly querulous. I recognized him mainly by his profile and his pale, heavy-lidded eyes. I look forward to his next appearance in Episode 6, where he may have more dialogue. *The visuals: Beautiful from start to finish. While I would prefer to see more attention to plot and character interaction, I can’t deny that there was plenty of “pretty,” whether your idea of “eye candy” is seascapes, blooming meadows, or a shirtless Aidan Turner. *Jim & Jinny’s Story: Like Verity and Blamey’s romance last week, this felt rushed and truncated. The screenwriter seems to be trying to relate one subplot in its entirety per episode, when a smarter choice might have been to let multiple storylines play out over several episodes, which would also allow for better character development. Jim and Jinny are more significant characters in the book. They have been courting for some time when the story begins, they eventually get married (not a shotgun wedding, either) and have three small children by the time Jim—trying to provide for his young family—goes out poaching with an older, more disreputable man and gets captured and sentenced to two years in jail. 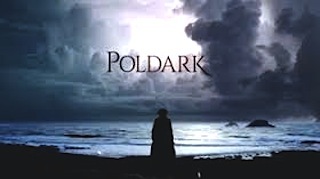 In both the novels and Poldark 1975 we’re given time to get to know and care about this young couple, and to understand why Ross is so desperate to save Jim, who suffers from miner’s phthisis, from the almost certain death sentence he’d face in prison. This much younger Jim comes across less as a devoted family man than as a juvenile delinquent who knocked up his teenage girlfriend and robs convenience stores with his buddies on weekends. Consequently, I felt less sympathy than I think I was expected to feel. *Francis is still a hot mess as a character. At this point the only consistent thing about him is his inconsistency. Twice he throws Ross and Elizabeth together—at last week’s ball, then this week’s christening—only to fly into a jealous snit when he sees them interact, usually right after George whispers something malicious in his ear. Make up your damn mind. Either you’re secure enough in your wife’s fidelity to let her converse with her old flame, or you don’t want them sharing airspace ever. Pick a position and stick with it. Depicting Francis as incompetent at the family business and unable to connect with the Grambler miners doesn’t help either. In the books, he wasn’t as knowledgeable or hands-on with the mining community as Ross, but he wasn’t a complete ignoramus either. *George: This drawling, languid fop is nothing like the ambitious, driven parvenu whose ruthlessness conceals his self-consciousness, deep insecurity, and his secret passion for Elizabeth. In fact, I haven’t seen a single trace so far of George’s desire to possess Francis’s wife, which is one of his defining traits in the novels. There’s an even less explicable omission, which I’ll get to in the next category. *Where in the world is Nicholas Warleggan? George’s powerful, grasping father is a huge influence on him, and plays a significant role in the books. Nicholas is, in fact, on the bench with Rev. Halse during Jim’s trial. So Ross’s attempt to get Jim off is doubly hard because he’s on hostile terms with two magistrates, having previously clashed with Nicholas over ownership of Wheal Leisure. Both Warleggans, father and son, are eager to take Ross down, though George becomes the more ruthless in pursuit of that goal. Nicholas’s absence and his replacement by Cary Warleggan—a comparatively minor character—is one of the most mystifying changes in the new series. * I don’t care how well Ross gets on with his tenants/miners, they wouldn’t be calling him by his Christian name! He’d still be “master,” “sir,” or most often, “Captain”—not because of his military rank but because he’s a mine captain. *The fashions—especially the men’s—are all over the place, and it’s become increasingly jarring as the series progresses. These are the 1780s—the era of tricornes, periwigs, queues, full-skirted jackets, embroidered waistcoats, and knee breeches. Yet Francis and George look like refugees from Jane Austenland, with their Brutus crops, high-crowned top hats, and tail coats—styles that won’t become the rage until the 1810s. *A certain earthiness is missing from the period as well. It’s hard to describe, but the Georgians were more open, more outspoken, even lusty about their passions and appetites. The cool restraint that marked Regency society was still a good thirty years away. By contrast, this was an era in which Francis and his Great-Aunt Agatha could engage in a swearing contest—with the latter emerging as the winner! But this Francis is too mealy-mouthed and this Agatha too restrained for me even to picture such an occurrence. *Elizabeth has “an inquiring mind” and an “unladylike” interest in mining? Since when? Grumblings aside, though, I’m still committed to watching the whole series, which has the potential to become more interesting now that Ross and Demelza have tied the knot.